PES students Spencer Allen, Pilar Fanaselle, Rebekah Elliott and Jessica McBride took part in a unique course on sales for social impact and used their experience to take second place in a national 3M sales competition. 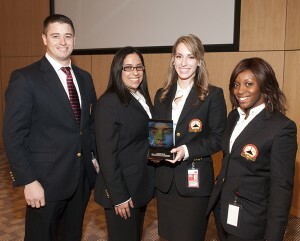 Four students from the Program for Excellence in Selling (PES) at the University of Houston C. T. Bauer College of Business recently placed second in a national corporate responsibility sales competition held by 3M in St. Paul, Minn.
Spencer Allen, Rebekah Elliott, Pilar Fanaselle and Jessica McBride — all advanced graduates of PES — made up the team that earned one of the top spots among seven universities nationwide. As part of the competition, the students enrolled in Sales for Social Impact, a pilot course with curriculum focused on advanced sales planning and implementation in a challenging market, Uganda. “For each of us — the students, the professors and the 3M partners — the Sales for Social Impact, funded by 3M, was one of the most challenging and inspiring experiences of our lives,” said Carl Herman, SEI director of operations and one of the course’s instructors. “We were challenged to produce a very high quality result and inspired by the opportunity to change at least a small part of the world,” he added. With only eight students broken into two teams, the class analyzed market segments and customer behavior, determined product value, identified distribution channels and key risks, positioned against competitive options and developed a sales plan. Compatible Technology manufactured the sales product, a manual grinder. McBride’s teammates agreed, citing the experience as one of the most defining of their college careers. The sales curriculum, developed by Acara Institute, followed corporate business processes used at companies such as 3M, a sponsor of the program. 3M is one of 27 corporations that currently partner with the Program for Excellence in Selling and their umbrella organization Sales Excellence Institute.